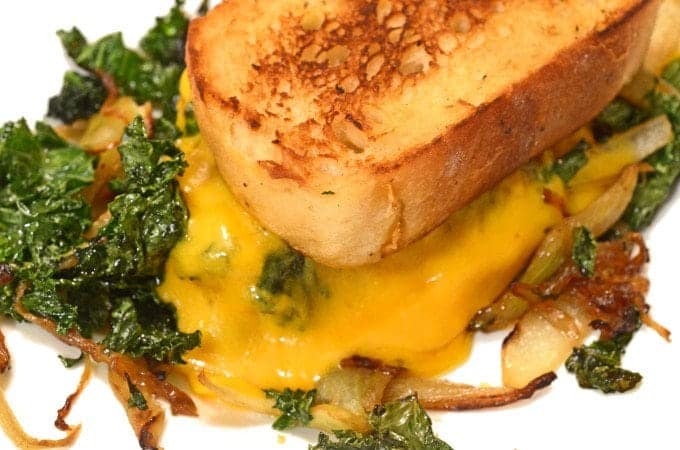 Caramelized Fennel, Onion & Kale Toasted Cheese Sandwich Recipe – Grilled and toasted cheese sandwiches are something we all grew up with. For those of us with kids, this iconic American entrée has followed us well into adulthood. 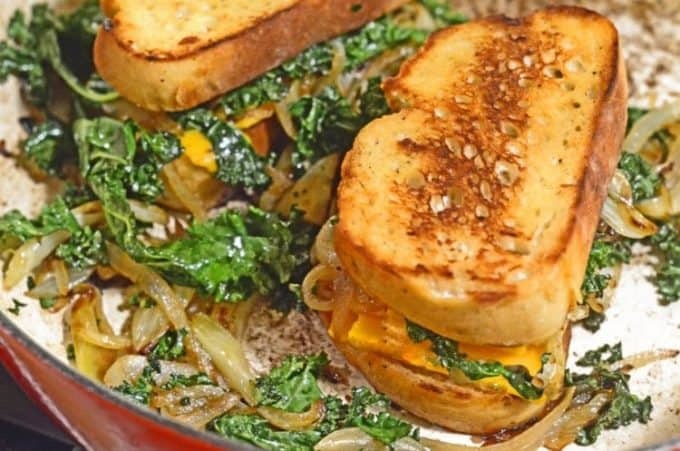 It only seems fitting then that we mixed things up just a bit, to create this Caramelized Fennel, Onion & Kale Toasted Cheese Sandwich Recipe. We’ve used kale a few times in the past. Once again while using a healthy and readily available component such as kale that we don’t feature frequently, we had to ask ourselves why do we not use this more often? In the event you aren’t familiar with kale, it is one of those dark, green and leafy vegetables that we all learned about in health class. 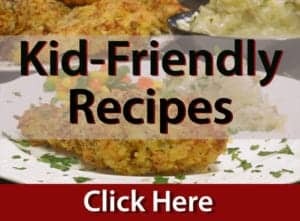 Kale is actually one of those super-foods, haled as some to be the “Queen of Greens,” and the “New Beef,” it is without any question at all a nutritionally-packed powerhouse of a vegetable. 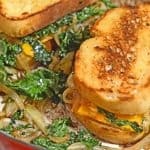 This Caramelized Fennel, Onion & Kale Toasted Cheese Sandwich Recipe is a veritable meal, unto it’s own. 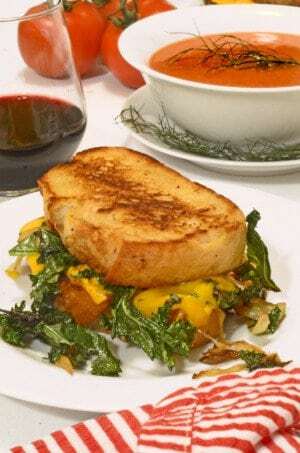 Packed with savory, caramelized vegetables, super-healthy kale, and extra-sharp cheddar cheese, we chose to hold this all together between two skillet-toasted slices of Asaiago artisan bread. Besides being a completely delicious and nutritionally sound meal, with this Caramelized Fennel, Onion & Kale Toasted Cheese Sandwich Recipe I was able to use my new Dutch oven-style enamel-based skillet who I have affectionately named William (in honor of his place of birth, William -Sonoma.) It’s one of the best Christmas gifts I’ve ever received from myself. 1 fennel bulb thin wedge cut. 4- 6 slices Wisconsin extra sharp cheddar cheese 4-6 oz. In large skillet, heat olive oil over medium flame. Add fennel and onion, stir to caramelize until onions are soft and translucent, about 10 minutes. Season with salt as desired. Add kale, stir until soft and bright green. Remove vegetables from skillet, cover to keep warm. Place bread in skillet, flipping each side to pan toast. Divide cheese and place on top of two of the four slices. Crown with caramelized vegetable. Top each portion with remaining 2 slices of bread. Cover skillet, and over low heat, cook until cheese is melted. That’s what I call a perfect cheese sandwich. You can’t go wrong with a combo of kale and fennel! 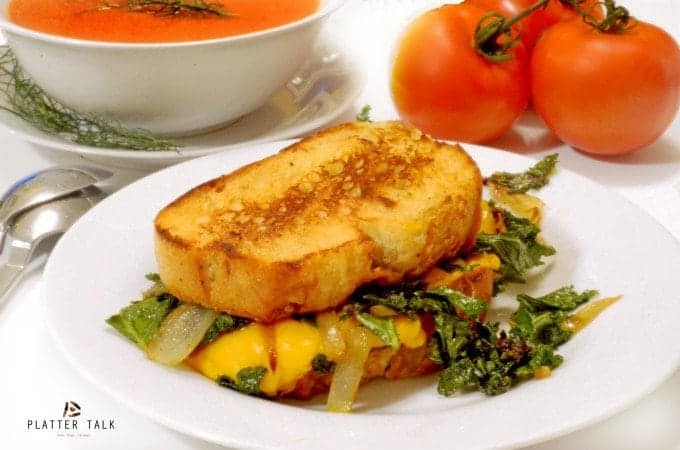 woah – now thats not your ordinary grilled cheese sandwich is it? so over the top delicious!!! Thanks, chef; you’re pretty much spot-on! Mm, i love this different twist on the classic grilled cheese sandwich! Looks so appetizing and nutritious with the addition of fennel & kale. Ha, it’s pretty cool you named your Dutch oven William. 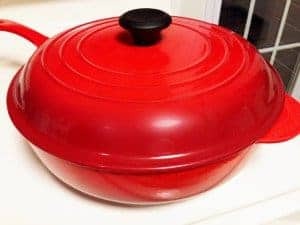 I have a similar one from le Creuset and love using it all the time. Now that is one awesome grilled cheese. 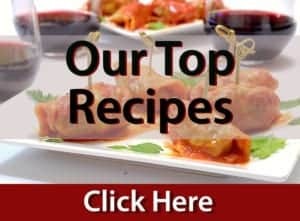 I love fennel– it just isn’t used enough in recipes! Thanks, Michelle and you are so right; fennel is definitely an unsung ingredient! Oh my God, Dan, that looks AND sounds absolutely delicious! Who doesn’t love good grilled cheese sandwich? What great photos you captured! Now that’s one way to get your greens! Indeed, our kids even love this one! This makes a great breakfast sandwich! Love the oozing cheese from the sandwich! Makes me want to grab it right off. Lovely flavors here. I love a grilled cheese sandwich and this takes it to a whole new level! delicious? I love all the flavors on this sandwich!! Looks so cheesy and delicious! Thanks, so much. It definitely brings up the level of a regular toasted cheese sandwich! I love adding veggies to my cheese sandwiches. I feel so much healthier about eating a mouthful of cheese that way 😉 lol. Sounds delicious! Oh my word. I love that you’ve added loads of nutritious veggies to an old favourite, but it still looks gooey and delicious! I want it to be sandwich dinner right now! I’ll try it with cheddar, but what do you think of parmesan as an option? Parmesan sounds like it would give it nice Roman flare!